A Photographic Memory: George Masa’s life journey carried him across an ocean and landed him in Asheville, where his passion for photography drove him to explore WNC’s roughest wilderness. This memory, given in a 1979 interview with oral historian Bruce S. Greenawalt, is the image most people who knew George Masa (approx. 1881-1933) recall. 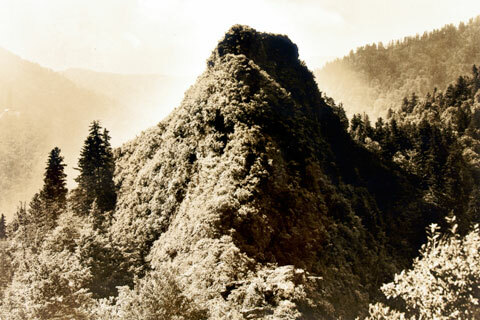 He was a small, wiry man, “not more than 125 pounds soaking wet,” recalled Ed Corpening, one of the many Great Smoky Mountain locals whom Masa befriended on his photographic explorations. This spry, witty, and outgoing bundle of energy (“less talk, more walk!” he would jokingly urge hikers along a trail), was often seen pushing his cyclometer, camera on his back, and usually dressed in jodhpurs and impeccably polished leather boots that reached to his knees. It was a Great Gatsby look fit for the 1920s. The only exception was a red bandanna wrapped around his head. Like the novel, Masa’s time in Asheville coincided with the town’s gilded age—when the ultra wealthy and literati were regulars in what was one of the top resort towns in the country. And Masa could have been a character out of Fitzgerald’s book. He had charisma and an infectious joie de vivre that allowed him to make friends easily with people of all backgrounds—the famous and well-to-do and simple mountain folk, alike. These qualities were balanced by a sensitive nature and an artist’s eye. The photographs Masa took during the 1920s and early ’30s are breathtaking in their richness and clarity—leaving us a visual record of Appalachia before the effects of modern growth. Masa had a knack for knowing exactly the right conditions when the sun, clouds, and sweeping shadows were coming together in harmony to create an image of impeccable composition and grace. Though the camera was cumbersome, Masa preferred the crisp clarity of its large format images. He often spent days in the mountains before he found the right setting. Then he would wait patiently, sometimes for hours, for the moment to release the shutter. He and his friend, writer Horace “Kep” Kephart, would become regarded as experts on the Western North Carolina mountains. And, like his contemporary, Ansel Adams, whose photography played an important role in the protection of King’s Canyon and the development of Yosemite National Park, Masa’s pictures and mapping were pivotal in the establishment of Great Smoky Mountains National Park. Masa was an unlikely candidate to become a great American photographer. He was born Masahara Izuka in Osaka, Japan. Much of his Japanese antecedents remain enigmas due to the fact that he was a private man and talked very little about his life. News reports during this time claimed that he was the son of a jeweler and had attended Tokyo’s prestigious Meiges University. He came to the United States around 1905, perhaps to continue studies in mining. He traveled throughout the country before settling in Asheville in 1915, where he took a job in the laundry room at the Grove Park Inn. Within three years, Masa anglicized his name and started a professional photography business, Plateau Studios. His photographs of the majestic mountains were seen in promotional brochures and magazines across the country. The Grove Park Inn was an ideal starting point for Masa. Within months of his arrival, he had graduated from the laundry room to valet’s desk where his outgoing nature made him popular among the guests. He was on a first-name basis with many of the aristocratic elite who asked him to accompany them on hikes and picnics. It was during this time that Masa began seriously experimenting with his camera, starting a side-business photographing hotel guests and processing their pictures. He also caught the attention of Fred Seely, the hotel’s manager, architect, and son-in-law of Edwin Wiley Grove. Seely would, along with other notables such as the Vanderbilts, become a lifelong supporter of Masa’s endeavors. Masa was ambitious, and in 1919, he was ready to start his own business. After a short period spent working with Asheville photographer Herbert Pelton, he opened Plateau Studios. It was an immediate success, and he served as a stringer for national news services and provided scenic pictures for the Asheville Postcard Company. It was this latter endeavor that took Masa deeper into the mountains as he searched for never-before-seen views that would appeal to the public. He often spent weeks alone in the wilderness. It was at about this time that he met Kephart, a former librarian famous for The Book of Camping and Woodcraft and Our Southern Highlanders, both considered seminal works on mountain life. Kephart had lived deep in the Appalachians for almost 10 years. The two men shared a passion for nature and became close friends. Most of all, they shared a love for the countryside that Kephart expressed through his writing and Masa through his photography. They were an unlikely pair of explorers, yet the two men were largely befriended by the people they met. Both were admired for their acceptance of the local ways. The 1920s were the period when over-timbering was taking a disastrous toll on the landscape—entire mountain faces were being stripped for lumber. Preservation became paramount, giving birth to the movement that formed Great Smoky Mountains National Park. The two men worked tirelessly to support the cause, scouting and mapping peaks and trails. It was not easy going. With his camera and cyclometer, Masa meticulously catalogued mountain peaks and the names they had been given by settlers and the Cherokee, as well as the distances between them. In order for Great Smoky Mountains National Park to be created, huge amounts of support materials were required. Not only were Masa’s photographs of specific peaks essential to the National Park Service personnel, he had amassed extensive data that had previously not been measured. Perhaps equally as important was the emotional impact of his photography. The images were inspiring and helped persuade many people to support the park movement. One of the most significant people to be so influenced was Mrs. Calvin Coolidge. In 1928, Masa prepared a book of photographs of the Great Smokies, which he sent to her at the White House. Similarly, his photos and measurements assisted in the development of the Appalachian Trail. He was in regular contact with Myron Avery, chairman of the Appalachian Trail Conference, and attended the group’s meetings, working with members to scout, mark, and measure sections of the proposed trail in the Southern Appalachians. He also suggested trail routes. With Kephart and Avery, he formed the Carolina Appalachian Trail Club in Asheville to promote the creation of the Appalachian Trail. The group eventually became the Carolina Mountain Club. After the stock market crash of 1929 and the ensuing lean times, Masa remained characteristically optimistic and continued to spend what little money he had on his research trips. And despite Kephart’s untimely death in 1931 in an automobile accident, Masa never lost his resolve. When Masa died on June 21, 1933, he was virtually penniless and had no known next of kin. Yet hundreds attended his funeral at Asheville’s Riverside Cemetery. And while he didn’t live to see the culmination of his and Kephart’s efforts, his photography and meticulous notes helped create the park in 1934. Masa certainly didn’t meet one’s standard perception of the typical mountain man, yet his unbounded love for Appalachia was as true as the photographs he produced. He captured the spirit of the mountains with images that harnessed the exhilarating expanse of vast mountains against sky. Like other great artists, his work will continue to transcend time and inspire.